Vibratech TVD is a driveline vibration damper supplier to many bus manufacturers. One market leader was faced with a potentially deal breaking NVH concern. What was described as a 'driveline growl' was reverberating through the body panels and creating an uncomfortable passenger environment. The noise was more pronounced at idle when stopped in traffic. won't accept because of driveline noise"
The bus manufacturer concluded that all supplied powertrain components met their respective requirements. For an expert analysis, Vibratech TVD was sought after to help solve the challenge. The buses were equipped with a new in-line six cylinder diesel engine and hybrid transmission. The driveline consisted of a traditional T-drive layout. A legacy Vibratech TVD viscous damper from another configuration had been installed between the tranmission and driveshaft. A test plan was developed and the Vibratech TVD engineering team, along with mobile testing equipment, arrived at the manufacturer. 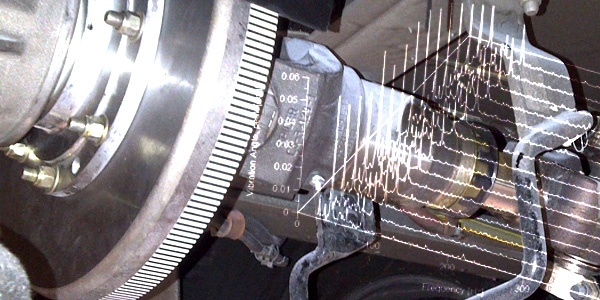 A laser optical sensor was fitted to the legacy damper to read the driveshaft vibration while accelerormeters on the transmission tailshaft housing and axle pinion housing would help to determine the source. 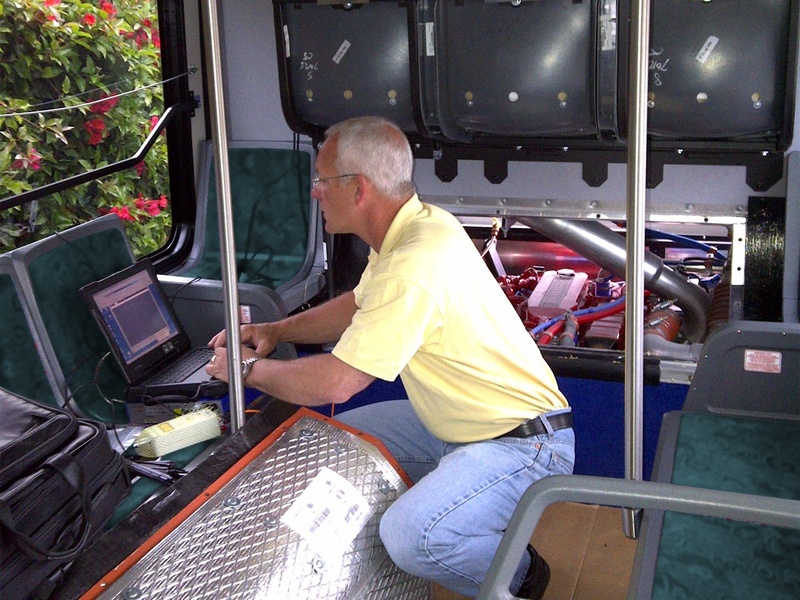 Measurement recording equipment, along with an engineer, was located inside the bus. 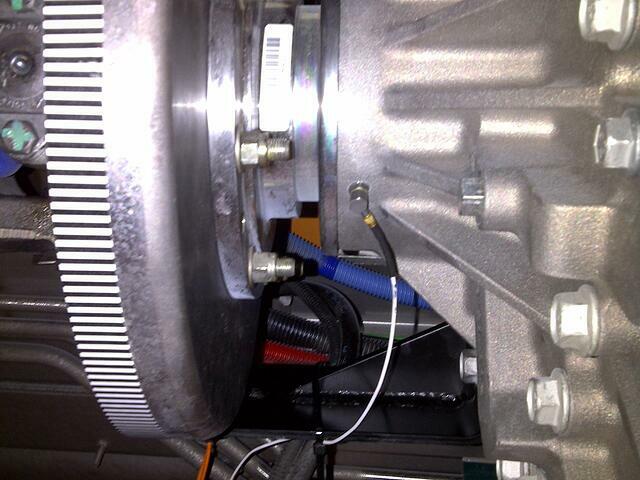 A laser optical sensor measures driveshaft torsional vibration. 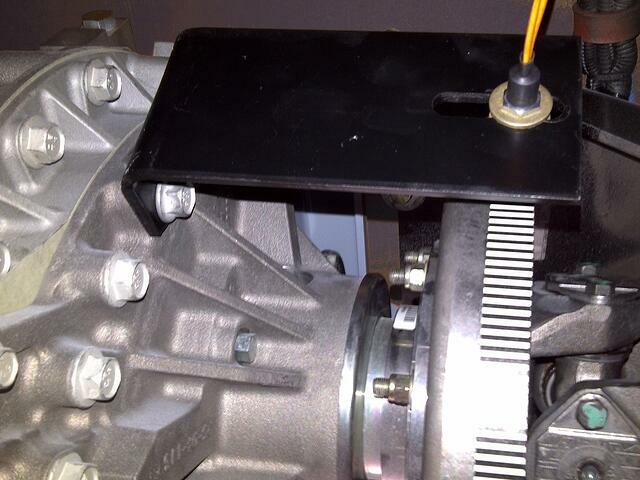 Accelerometer on the transmission tailshaft housing helps determine the source of the vibration. At a constant driveshaft speed that produced the audible noise inside the bus. Accelerating from a stop through the RPM range that produced the noise. At idle to monitor axle and transmission levels without driveshaft rotation. The Vibratech TVD engineering team discovered that at idle, with the transmission operating in electric mode, the driveshaft was rolling back and forth through the backlash of the rear-end gears. The vibration in this case was at just the right frequency, plus outside the range of the legacy damper, to set up an uncomfortable audible 'growl' inside the bus. Vibratech TVD developed a new tuned torsional viscous driveline vibration damper to mount between the mating flanges of the transmission and driveshaft to control the roll, reduce the vibration amplitude and shift the driveline resonance point below the operating range. This limited the audible growl to a level that was acceptable when seated in the passenger cabin. Phil DeBerry of Anger Associates, Inc. partnered with Vibratech TVD's engineering field team during this case study. From a design perspective, Vibratech TVD Senior Product Engineer, Aaron Neyman comments that "size constraints are a challenge in driveline applications." For many manufacturers the need for a vibration damper isn't discovered until well into the final assembly and product testing. Partnering with Vibratech TVD early in the powertrain design phase has the potential to reduce costs, provide greater integration flexibility, and increase speed to market. Read more about the benefits of a viscous driveline damper. For this transit bus manufacturer the Vibratech TVD viscous driveline damper solved the hybrid drive NVH concern. The customer was completely satisfied with the long term approach to resolve the vibration at the source. The expert analysis and manufacturing quality of Vibratech TVD was an ideal solution. Test data and understanding the difference between a Vibratech TVD viscous driveline damper and crankshaft damper are available in the new article Driveline Vibration Damper Development.